Soo Zee and Leigh make videos on the Internet. This is their website. Hapcheon is not a place where you accidentally end up. You are probably there for one thing — the Tripitaka Koreana (팔만대장경). Located an hour away from Daegu city, Hapcheon is a small town with a big history. Home of the Tripitaka Koreana, a collection of Buddhist Scriptures carved onto 81,350 wooden printing blocks officially deemed a Korean National Treasure, Hapcheon is a lovely place for a day trip. This is the main (and more or less the only) attraction in Hapcheon. These 81,258 wooden carved blocks are of the Buddha’s teachings. People say it’s the most complete version of all. The content of the blocks isn’t why tourists make pilgrimages there. After 700+ years, these wooden blocks are still in excellent condition. The amount of time and care that went into creating the blocks themselves is amazing. The wood was soaked in sea water for three years, then cut into individual blocks during the winter to prevent warping. Each piece was then boiled in salt water to prevent insect infestation and mold, and dried before being carved. The delicate carvings of the characters are incredibly consistent in form, as if they were the work of one person. We haven’t even gotten to the most amazing part. The building that kept the wooden blocks in as-good-as-new condition after 700+ years is equally incredible. They thought about every little detail: the altitude, the wind, the humidity, the sun, the temperature, for every season. This was all calculated down to the tiny minutiae. They calculated the width of the widows so the right amount of breeze from the mountain and the breeze from the lake will balance airflow. The breeze that has more humidity will pass through faster while the breeze without humidity will pass slower. Thus, without any modern technology or any devices, the building is naturally keep at 80% humidity and never goes down to 40%, even in the dry season. Besides the windows, the flooring is finished with charcoal, salt, and lime powder to absorb the humidity. Unlike modern techniques, this building uses sunlight to its advantage. This was very surprising to us. Isn’t sunlight notoriously bad for ruins? Apparently, they constructed it wisely enough that the sun will come in the morning from South where it will only touch the ground, not the wooden blocks. The sun heats up the ground on the South, leaving the North side of the ground kept cool, helping the circulation within the building. And in the afternoon, the direction of the sun changes and the whole process repeats. This is some mind boggling science. It’s so mind boggling that in 1975, the Korean government tried to re-locate the Tripitaka Koreana to more a modern facility. However, when they moved the wooden blocks, the wood cracked and twisted, so they had to send it back to the original 700 year old building. Since then it has been kept in the mountains within in the temple. How did people figure this out 700 years ago?? This should be recorded as one of the unsolvable mysteries of all time. These wooden blocks not only show how Korea was ahead of the printing technology curve, they also show just how advanced the architecture was too. Somehow a centuries old method does an even better job than our modern science, with its humidity controls, temperature controls, and extra complicated sensors. 합천 영상테마 파크: After the Tripitaka Koreana, this is the next thing to see. After this, yes you can leave Hapcheon. This is an unusual theme park since there aren’t any roller coasters, but that’s also what makes it my kind of theme park. 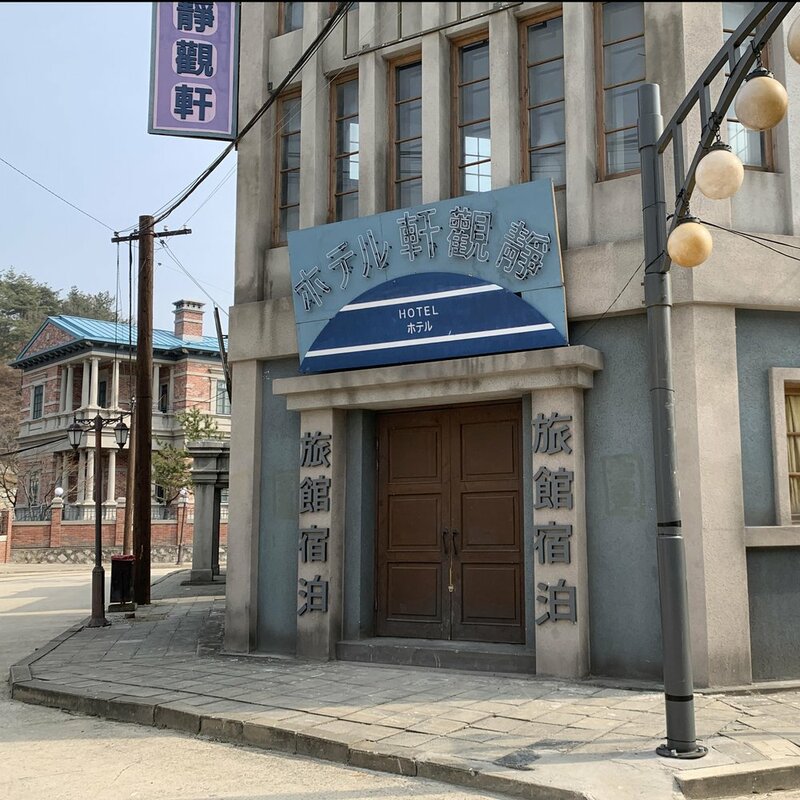 This park is divided into different areas that each imitate a different era. You can see the streets of the depressed '30s, the Japanese-influenced buildings, and our favorite, the glorious '80s. It also functions as movie set. The most exciting part was to see the actual media in these places. 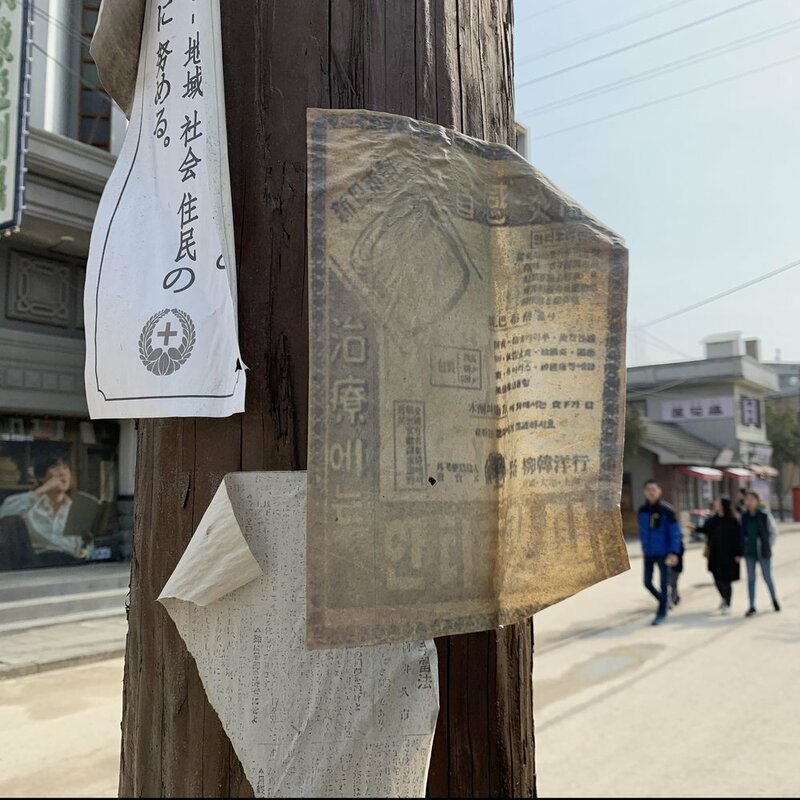 The newspapers, the advertisement papers stuck on a pole, the movie posters, the billboards, and even the blue house! The details were on point. The lettering and the visuals are accurate. I usually don't like places that are obviously meant for pictures like murals villages because they’re usually just tacky Instagram bait, but this place was pretty nice, and honestly when else are you going to be in Hapcheon? Take as many pictures you can here. It's awesome. It also helps that everything inside seems to be constructed to a 70% or so scale, which means any photos you take turn out somehow better than they would in real life since you can fit more in the frame. Pro Tip: There is going to be railway to the bluehouse after March, 2019 so most of you don’t need to drive or hike up there. There are many places in Korea where Korean beef is famous. 횡성 is one of them. I didn't know until we got here that there are more cows than people, or that they use some sort of special cooked feed to make the cows more delicious. Korean beef is expensive and we don't eat it often but here you can get local beef for good price. We heard there is even a whole street named Korean beef street. Rather than name a specific place, we’ll just say find somewhere convenient since there are so many beef specialty places in the are. Most of them are nothing fancy, but the beef is quality and that’s all that really matters, ins’t it? Your might be wondering where all the juicy meat pictures are. The true highlight is the 된장찌게 that comes after the grilling. They dump it into your grilling pan after you finish so it soaks all the meat juice from the pan and creates this delicious, meaty broth. It goes really well with salty soy bean paste. I’m salivating just thinking about it. The place we went was quite close to the theme park, and theirs had a very rare river creature, 다슬기, almost like a snail of some sort. It looks tiny, hard, and unappealing but it’s the secret ingredient that makes it extra delicious. Sanchae is wild-grown mountain vegetables that are foraged in the mountains of Korea. As 80% of the land in Korea is mountain, there are hundreds of different kinds of mountain vegetables. However, most of them are not grown at scale commercially and cannot been seen in the city. We get the popular ones in Seoul, but that is the very small percentage of all the sanchae out there. There is no best way to eat it. In Hapcheon we ate them as banchan, but you can also mix it in a bowl with rice and eat it as bibimbap. That’s also a great way to eat them. There is a whole collective of 24 different restaurants near Haeinsa temple. It's the best chance to try out some of the more unusual wild-grown Korean mountain vegetables. Do not miss! We are not against children but it’s nice to have some places that only adults are allowed. This coffee shop is how we imagined Snow White and the seven dwarves’ house would be. It’s cozy, well thought out, and has tons of nooks for reading, getting lost in absorbing conversations, or I guess snuggling if you’re that couple that likes to make everyone else in the place feel uncomfortable. Hapcheon is a very small town, which means it doesn't have public transportation. Depending on what you are going to do, your arrangements might look a little different. You can take a bus directly to Hapcheon from Seoul, but honestly Hapcheon has very limited public transit and it’s not easy to call a cab, so you’re better off renting a car. Also, unfortunately there aren’t many car rental places in Hapcheon, so we found it actually took the same amount of time as a bus if we took the ITX train down to Daegu and rented a car from there and drove, so that’s what we did. There aren’t many direct buses to Hapcheon, but there is one. Obviously it’s not a popular route. It takes 4 hours to get there, and if you’d like to go to Haeinsa, you will need to take another bus from Hapcheon city terminal. It will take about an hour. There is no direct ITX train to Hapcheon. The ITX is like a faster version of a regular train, but a bit slower than the bullet train. We rode the ITX from Seoul to a nearby city, Dae-gu, so we could rent a car. We rode a train from 영등포 station to 대구 station. It took us 3 hours and 15 minutes, then we drove 1 hour to Hapcheon. Let me reiterate: Hapchoen is a very small town, with limited public transportation. We used Socar, a car sharing and renting service for this trip. I prefer this rental company because you can rent it by the hour or by the day. Also, I don’t have to talk to a person on the phone. I’m not sure if you can use Socar with an international drivers license or not, but if we had to guess, we’d guess probably not. If you are not renting a car, the next best option is taking the bus. Since Haeinsa is the most popular destination here, there are buses from the Hapcheon bus terminal every hour or so. There are also buses directly to the Movie Theme Park from the Hapcheon bus terminal. The schedules are written at the bus terminal. There were only two options for us: either camp outside or go to a love motel. There aren’t many accommodation options here that aren’t camping and it was pretty cold out at the time of filming, so we stuck with a robo-love motel on the side of a dam reservoir called Moon Lake. They’re sometimes called drive-in motels, and while in other regions, love motels might be used exclusively for amorous congregations, in Hapcheon most of the online reviews are from travelers like us looking for an affordable place to stay the night. All in all it was clean, extremely spacious, and (as you might imagine from a hotel where you don’t have to talk to or see another human during your whole stay) quite private. It’s a stark contrast from the Hanok-style places we stayed in Gyeong-ju and Tong-yeong, where we slept on Korean-style floor beds and could hear everything the neighbors screamed at their kids through the walls. There aren’t the same kind of facilities you might expect from a larger hotel though, like a pool or fitness center, but there are Western-style beds!